Keeping up with the latest in lighting technology, CLS have purchased twelve of the new Martin MAC550 moving head fixtures for their hire department. Hot off the production line, the MAC550's are already in demand by CLS customers. award winning design of the MAC 2000. 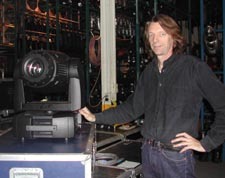 Combined with its motorized zoom and new color and gobo motors and unique gobo animation system, it is a small revolution in the world of quiet, mid-sized fixtures.